This evening’s selections are a quartet of Nick Adenhart cards. 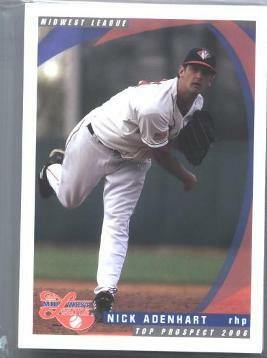 Adenhart played in Cedar Rapids in 2006. He was a fourteenth round draft pick out of Williamsport High School in Williamsport, Maryland by the Los Angeles Angels in the 2004 amateur draft. Nick Adenhart posted a 10-2 record and a 1.95 E.R.A. in 16 starts for Cedar Rapids in 2006. Adenhart struck out 99 batters in 106 innings of work. He was selected to the 2006 Futures Game roster, played in the 2006 Midwest League All-Star game and earned Midwest League post season All-Star squad honors. Cedar Rapids finished the season with a 65-74 record under manager Bobby Magallanes. Nick Adenhart was a bright young pitcher who played for the Cedar Rapids Kernels in 2006, and was a rising star in the Los Angeles Angels organization. Adenhart made his MLB debut on May 1, 2008. Adenhart compiled a 1-0 record with a 6.00 E.R.A. in four career starts for the Angels. Only hours after Nick’s 2009 season debut on the mound for the Angels, a drunk driver tragically killed him on April 9, 2009 at age 22. Nick Adenhart’s family continues to honor him by awarding a $1,000 scholarship in his memory annually. The Kernels Foundation is privileged to administer the scholarship on behalf of Nick’s family. 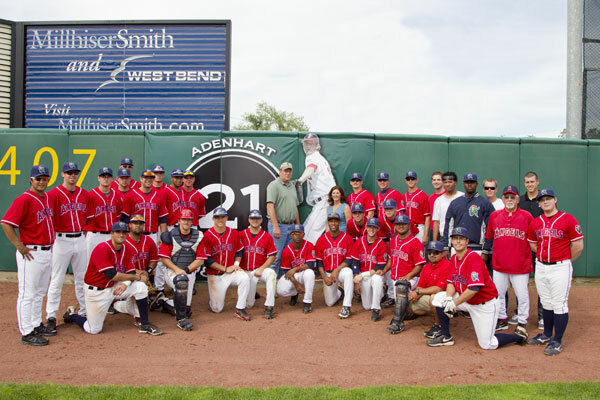 The Cedar Rapids Kernels and Kernels Foundation presented Mack Mattke as the winner of the 2012 Nick Adenhart Memorial Scholarship before the Kernels game on Sunday, June 24th. Mack is a 2012 graduate of Xavier HS where his school activities, academic accomplishments and baseball accomplishments were quite impressive, making him an excellent choice for the scholarship. The Mattke’s were a Kernels Host Family in 2006, giving Mack the opportunity to know Nick while he was with the Kernels. Mack plans on attending Purdue University to study engineering and play baseball. 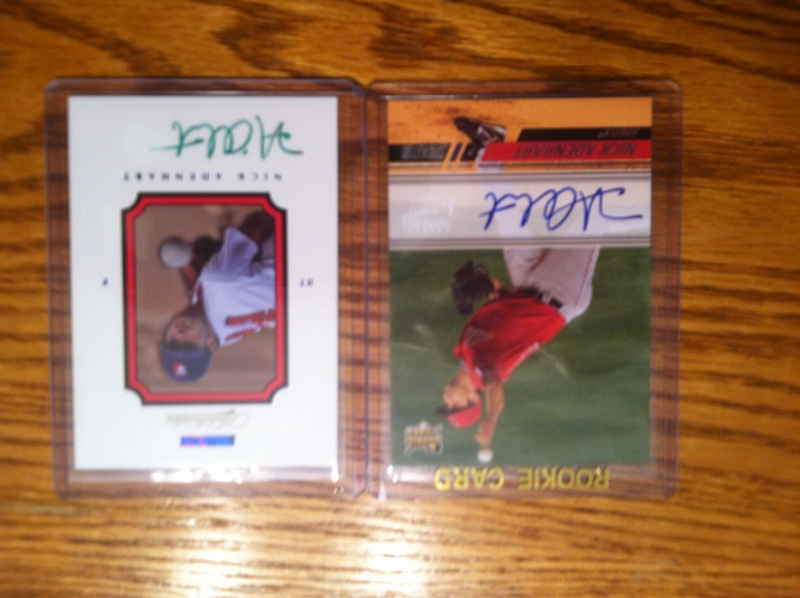 I have picked up a pair of autographed Adenhart cards. The first card on the left above is from the 2008 Topps Stadium Club set and is an on card auto. The other Adenhart autograph card above right is a sticker autograph card from the 2007 TriStar set and is serial numbered 176/250. Adenhart autograph cards do run a bit more than most of my collection due to his early passing. I picked these up for under $10 to my door but that is not the norm. 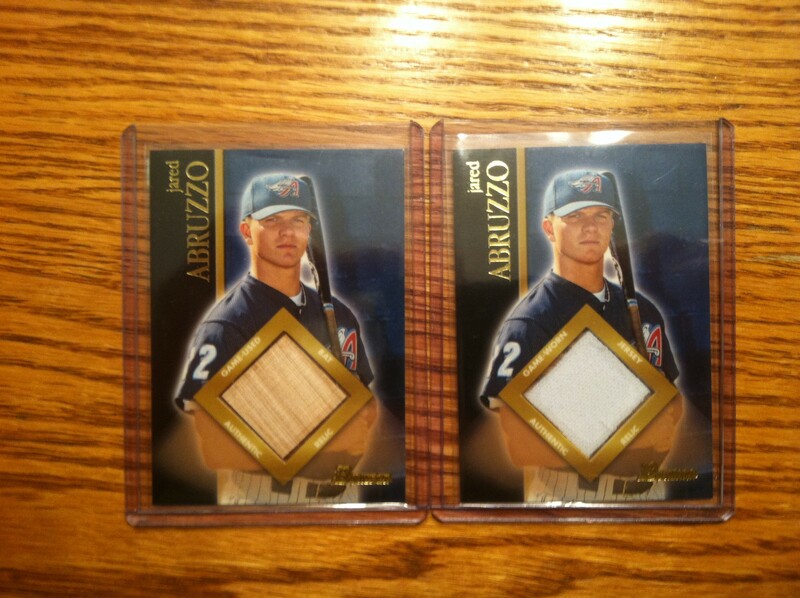 I have also picked up two different game used jersey cards of Nick Adenhart. 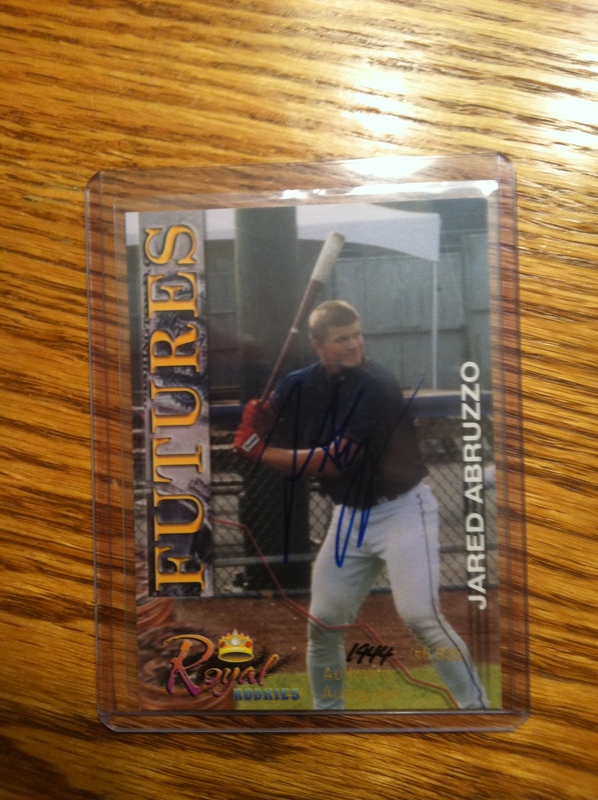 The card on the left in the image is a Futures Game jersey card from the 2006 Bowman Draft Picks & Prospects set. 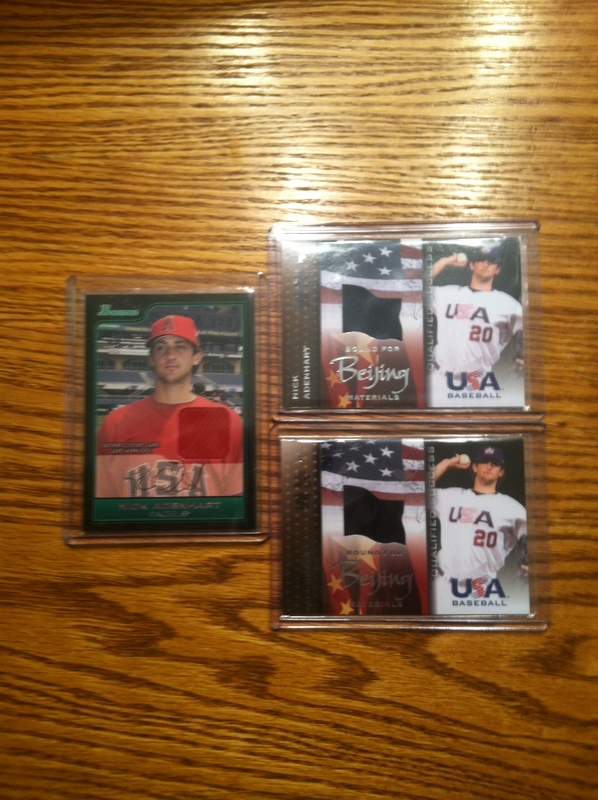 The other two are from an Upper Deck USA Baseball Bound for Beijing card set numbered GU-2 with pieces of a jersey used during the 2006 COPABE Beijing qualifying tournament in Havana, Cuba. Adenhart’s Jersey cards usually sell for between $5-10 to your door and can be found under $5 as long as you have patience. It is Iowa State Day at Perfect Game Field at Veterans Memorial Stadium this afternoon. 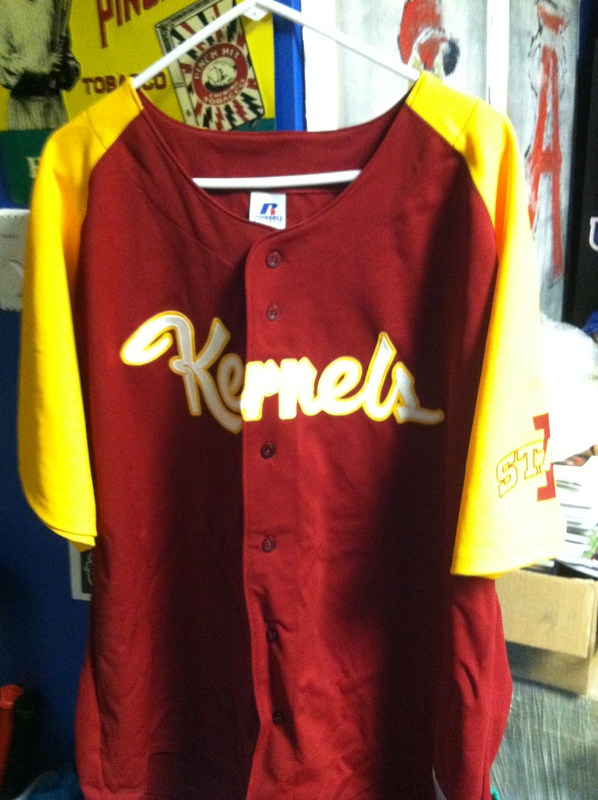 The Kernels will be wearing Cardinal and Gold jerseys that will be auctioned off during the game and the first 1000 fans through the gates will receive a free Cardinal and Gold ‘Party at the Park’ t-shirt. Gates open at 1 p.m. It is also Faith Day and Denny McClain is stopping by the stadium for the day to throw out a first pitch and sign autographs. There is a lot going on and it seems to have cooled down. Great day for some Kernels baseball. I started this blog in February 2011 and one of the early categories of posts was named Cael’s Collection. It highlighted the baseball cards of Cedar Rapids professional baseball alumni that I have picked up over the years. Cael is now 2 1/2 and someday all these will be his, so he gets the naming rights of this portion of my blog. Unfortunately for him, most of my cards are of minimal value, but the fun is in the hunt I suppose. There has been only one Iowa State Cyclone that played professional baseball in Cedar Rapids that went on to play major league baseball to the best of my knowledge. Dutch Levsen, a Wyoming, IA native, attended Iowa State University prior to becoming a member of the 1923 Cedar Rapids Bunnies team. Levsen went 19-4 in 25 games as the Bunnies finished 69-56 under manager Bill Speas to finish 3rd in the Mississippi Valley League. On August 28, 1926, Dutch Levsen became the last player in MLB history to pitch complete game victories in both ends of a doubleheader leading the Cleveland Indians to a 6-1 win with a four hitter in game one. He followed that with a 5-1 win in game two over the Boston Red Sox once again scattering four hits throughout the game. Levsen had a career year in 1926 posting a 16-13 record with a 3.41 ERA. Dutch Levsen finished his career with a 21-26 record and a 4.17 ERA during his six year career playing for the Cleveland Indians. I have picked up one Dutch Levsen through my collecting. 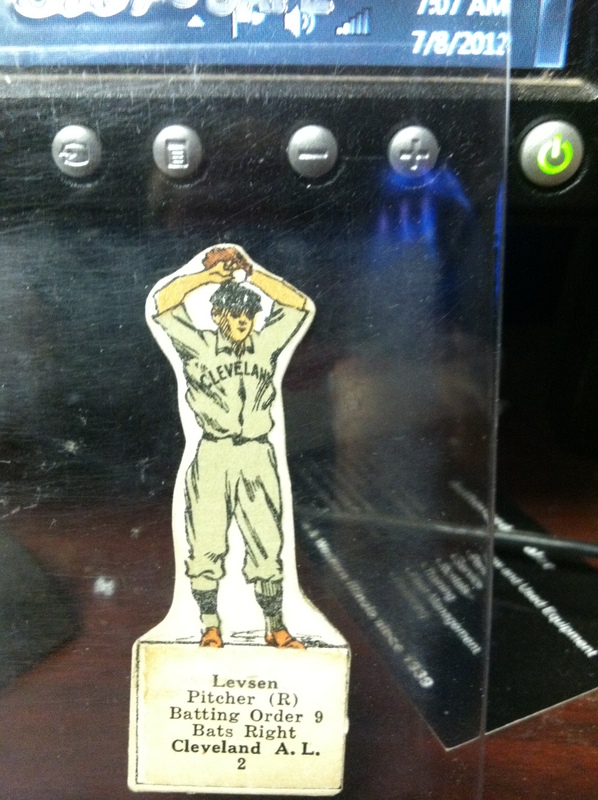 It is actually a item from a 1920’s game by National game Makers of Washington, D.C. The game was called “Major League Ball – The Indoor BB Game Supreme”. 14 die cut players were used for each team and all 16 teams were represented as rosters varied from year to year. The game was produced between 1921 and 1930. I bought this one on Ebay and have been looking for additional ones ever since but have yet to see another. I pick up cards of our alumni at local shows, regional shows if I can time visiting my older brother in Chicago correctly and we even hit the National the year it was in Chicago. Several of our local guys help me out when they are breaking boxes and hold on to stuff for me often with minimal or no payment. I am always in your debt Brian, John and Tim. You still have an open account to my comp tickets to Kernels games. The most common acquisition form has been the always present Ebay. It’s a dangerous place when you have 385 major league alumni and countless other minor leaguers who have had baseball cards produced. Here is another recent pickup. It ties in as it is Iowa State Day and This is a Cael’s Collection post. 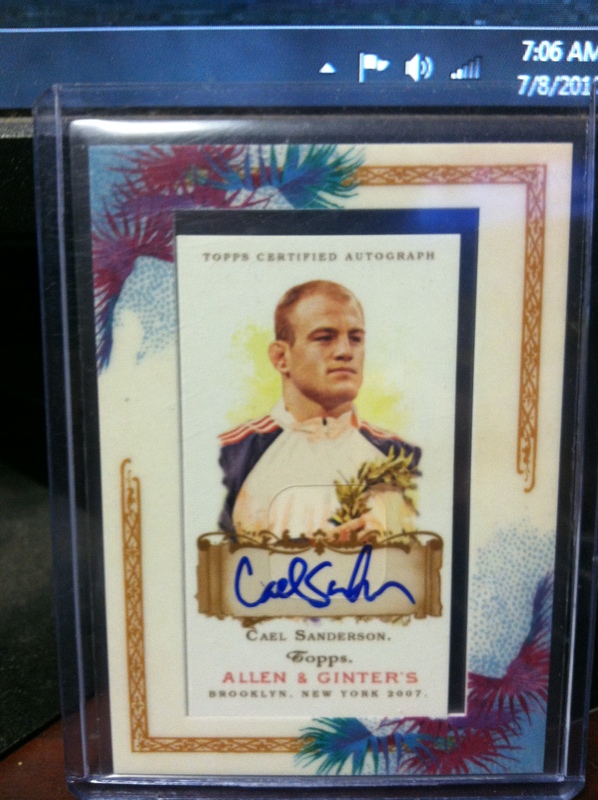 I finally picked up a Cael Sanderson Allen & Ginter autograph card this past month on Ebay. It came from their 2007 set and I hadn’t found one at a price I was happy with until now. I also picked up the Art Pennington auto graph from the 2009 Allen & Ginter set. Happy to hear is is taking part of the Major League All-Star festivities down in Kansas City this week. 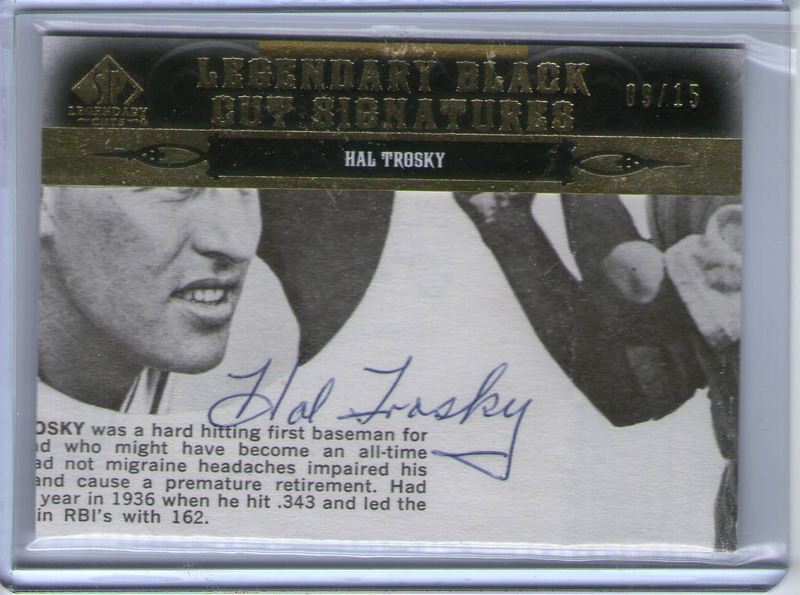 I posted a Cael’s Collection post early in my blogging career about a Hal Trosky cut autograph card. I picked up a different one from the 2011 Upper Deck SP Legendary Cuts baseball set early last month. It is a Legendary Black Cut Signatures card CLE-HT serial numbered 9/15 but it doesn’t have quite of nice a cut as the previous cut auto. This did come at a much cheaper price at $27 via Ebay. Hal Trosky was part of the 1931 Cedar Rapids Bunnies squad that finished 2nd in the Mississippi Valley League with a mark of 74-52 under manager Paul Speraw. Hal hit .302 with three home runs in 164 at bats as an 18 year old. 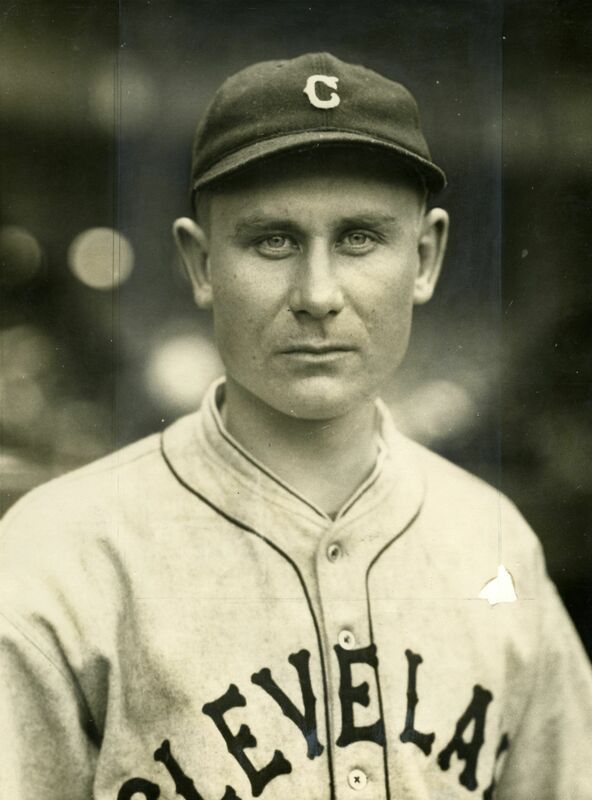 Trosky played 11 season for the Cleveland Indians and the Chicago White Sox. The Norway, IA native posted a career batting average of .302 with 228 home runs and 1012 RBI. The earlier entry about our baseball card team set giveaway coming up this Sunday got me thinking. I started this blog in February 2011 and one of the early categories of posts was named Cael’s Collection. It highlighted the baseball cards of Cedar Rapids professional baseball alumni that I have picked up over the years. Cael is now 2 1/2 and someday all these will be his, so he gets the naming rights of this portion of my blog. Unfortunately for him, most of my cards are of minimal value, but the fun is in the hunt I suppose. The previous entry about our baseball card team set giveaway coming up this Sunday got me thinking. I started this blog in February 2011 and one of the early categories of posts was named Cael’s Collection. It highlighted the baseball cards of Cedar Rapids professional baseball alumni that I have picked up over the years. Cael is now 2 1/2 and someday all these will be his, so he gets the naming rights of this portion of my blog. Unfortunately for him, most of my cards are of minimal value, but the fun is in the hunt I suppose. I pick up cards of our alumni at local shows, regional shows if I can time visiting my older brother in Chicago correctly and we even hit the National the year it was in Chicago. Several of our local guys help me out when they are breaking boxes and hold on to stuff for me often with minimal or no payment. I am always in your debt Brian, John and Tim. You still have an open account to my comp tickets to Kernels games. The most common acquisition form has been the always present Ebay. It’s a dangerous place when you have 383 major league alumni and countless other minor leaguers who have had baseball cards produced. I haven’t made a Cael’s Collection post in quite some time so I will be making up for lost time sharing some of my recent additions. 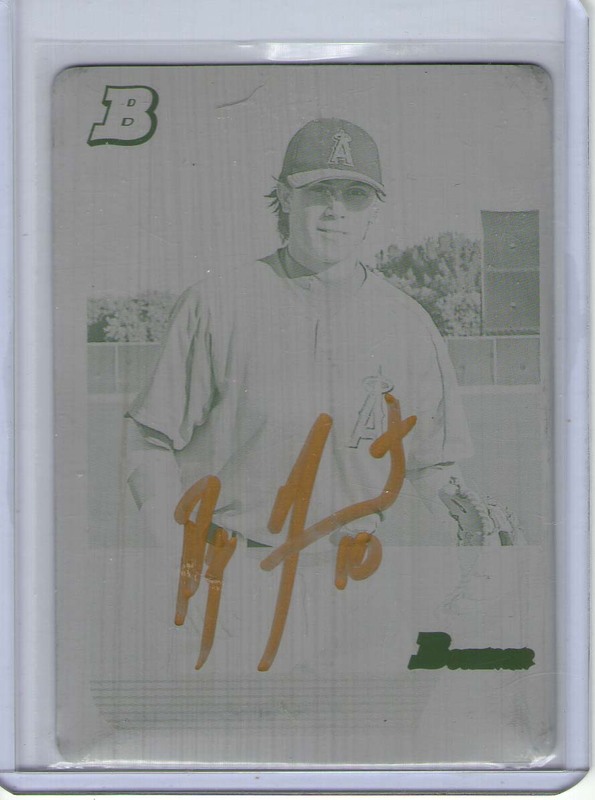 Recently, I picked up a Cam Bedrosian printing plate card up off of Ebay for a reasonable price. Printing plate cards are a fairly recent addition to the collector’s market. Each set of cards is produced using large printing plates. 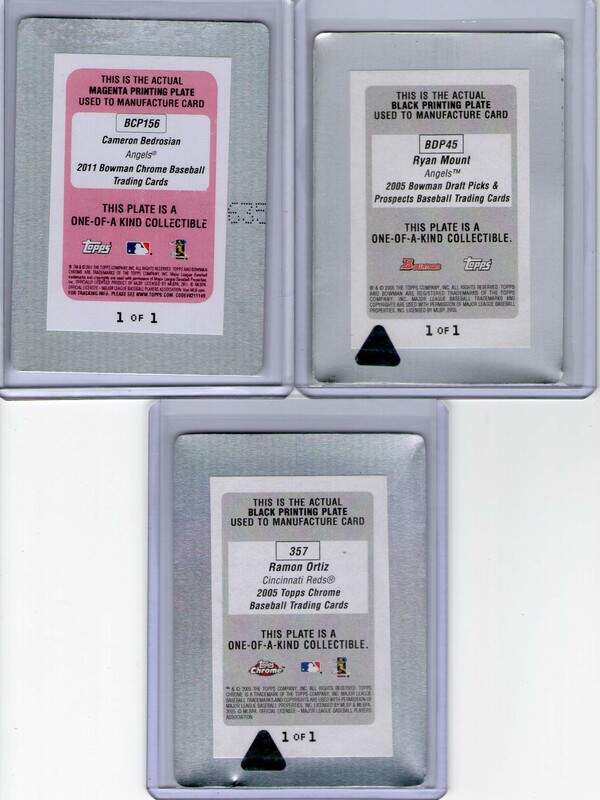 There are four different printing plates used for each card (Cyan, Magenta, Yellow and Black). The plates are cut up and individual printing plate cards are then inserted into product at a very low rate making these among the rarest of cards. Each is designated as a one of one card as there is no other one like it in the world. I have picked up three printing plate cards of Cedar Rapids professional baseball alumni. Ebay has been the source of these finds. 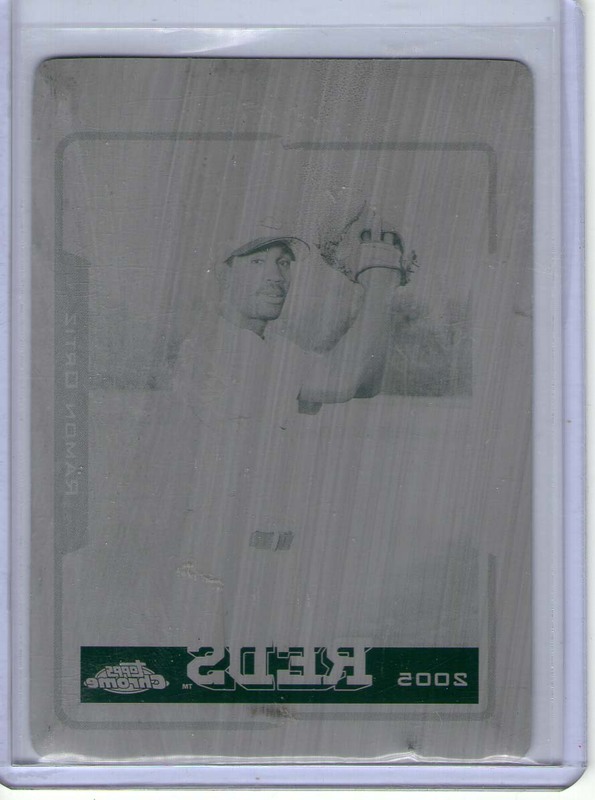 A Ryan Mount 2005 Bowman Draft Picks & Prospect black printing plate card BDP45 1 of 1 card cost me $10 back in 2007. I was lucky enough to get him to sign it while he was here with the Kernels that season. 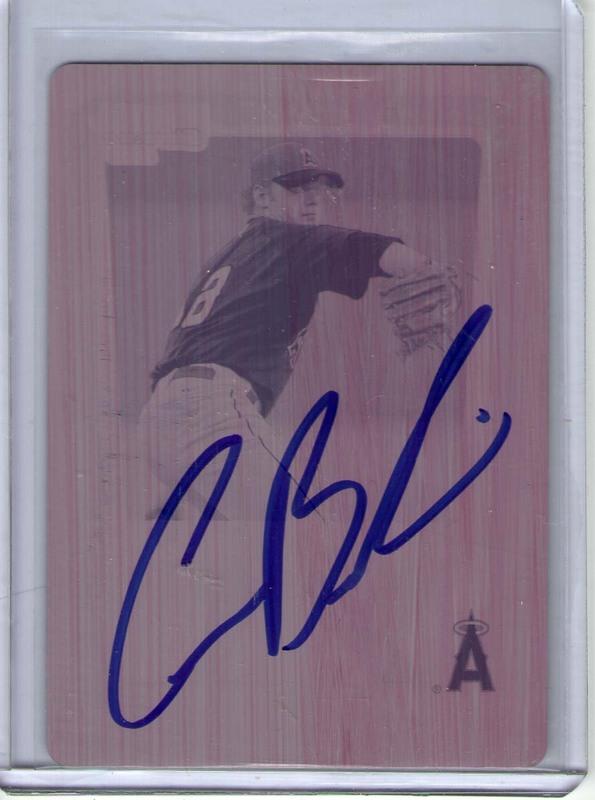 Last year, I bought a Ramon Ortiz 2005 Topps Chrome black printing plate card BDP45 1 of 1 card for $11 and then this past month I picked up the earlier mentioned Cam Bedrosian 2011 Bowman Chrome magenta printing plate card BCP156 1 of 1 card for $13. Bedrosian was kind enough to sign it for me. 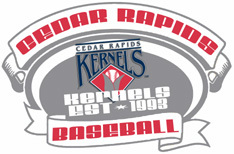 The first 1,000 fans through the gates at 1:00 pm on Sunday, June 10th receive a free set of 2012 Kernels Baseball Cards, courtesy Perfect Game USA. The Kernels play host to the Clinton Lumberkings with first pitch set for 2 p.m. 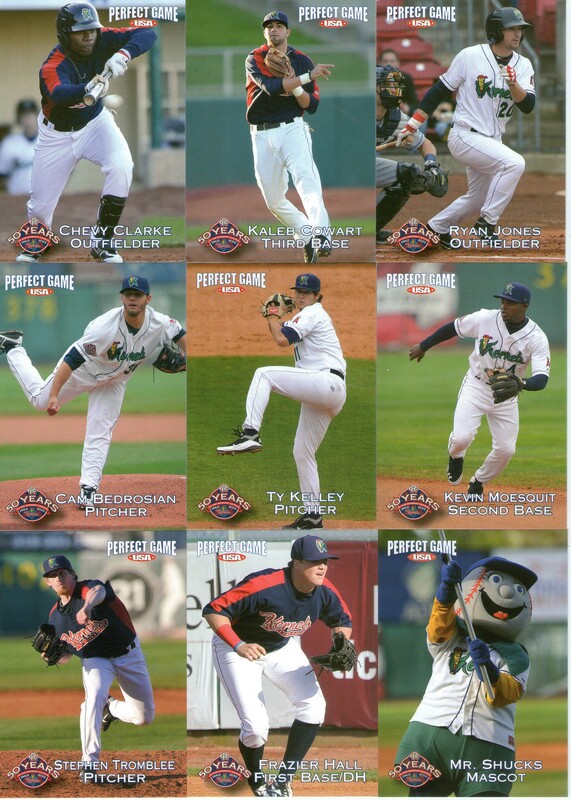 The 30 card 2012 Kernels set includes cards of three first round picks (Kaleb Cowart, Cam Bedrosian and Chevy Clarke) and three Midwest League All-Stars (Cowart, Kelley and Tromblee). If you are unable to attend the game on Sunday, the sets will be on sale at the Kernels website starting on Monday. Here is a sneak peak. The alumni card of the day is a 1991 Topps card of Kurt Stillwell. Stillwell was part of the 1984 Cedar Rapids Redsteam that finished 4th with a mark of 75-63 under manager Jim Lett. Stillwell hit .251 with 4 HR, 33 RBI and stole 24 bases in 112 games.Kurt Stillwell hit .249 with 34 HR and 310 RBI in his 9 seasons in Major League Baseball. Stillwell played for the Reds, Royals, Padres, Angels and Rangers. He was named to the 1988 All-Star team in his 1st season in the American League with the Royals. The alumni card of the day is a 2005 Topps Heritage card of Scot Shields. 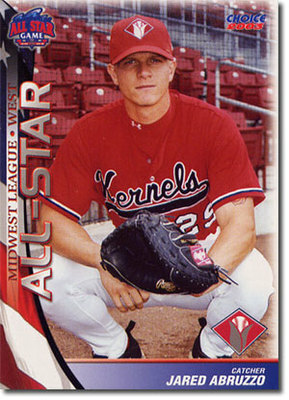 Shields appeared in 58 games for the 1998 Cedar Rapids Kernels. He posted a 6-5 mark with a 3.65 ERA while striking out 81 in 74 innings of work. The Kernels finished 71-69 under manager Garry Templeton. Scot Shields announce his retirement earlier this week. He finished his 10 year career with the Angels with a 46-44 record and a ERA of 3.18. Scot Shields was part of the Angels 2002 World Series Championship team. He led the American League in holds four consecutive years starting in 2005. Shields was selected as the Setup Man of the Decade by Sports Illustrated.